Here are some highly generalized, but humorous problems Giuseppe Furioso finds when looking at the judeo-supremacist 'holocau$t' lie. The Holocaust consists of three basic elements: (1) Approximately six million Jews were deliberately killed. (2) These killings were part of a state sponsored program on the part of the Third Reich whose ultimate goal was the total eradication of the Jewish people. (3) The bulk of these murders took place in special death camps where the principal mechanism of execution was the homicidal gas chamber that utilized Zyclon B, a commercial pesticide whose active ingredient was hydrogen cyanide. That the Third Reich possessed the technological and administrative means to carry out such a vast amount of killing there is little doubt. The Soviet Union with significantly inferior assets in these areas was able to kill far greater numbers of human beings. Furthermore, the armies of the Third Reich succeeded in killing at least ten million of its heavily armed military opponents in the course of World War II. Hence the killing of six million unarmed civilians should not have presented any unique problems to such an industrially advanced and bureaucratically efficient state as Nazi Germany, on the contrary, it would have been far easier. My doubts about the Holocaust are not centered on whether it could have happened but whether it did happen. In fact many of the doubts that I have are a direct consequence of the fact that I have no doubt that it actually could have happened...but certainly not in the ways that have been described thus far in the ‘’official’’ literature. It is part of the Western tradition in legal, scientific and intellectual matters that those asserting something have the burden of proof and that those who disagree are not required to provide evidence. This tradition however has been turned on its head regarding the holocaust since the ‘’historical truth’’ of the holocaust has been posited in advance. Furthermore, even to express doubts can result in criminal penalties in at least 11 so-called democratic countries and the ruining of lives and careers in numerous others. Listed below are some of the ‘’problems ‘’ I have with the Holocaust. Should these be cleared up it would go a long way toward my accepting it …they are in no particular order. 1) Why did Elie Wiesel and countless other Jews survive the Holocaust if it was the intention of the Third Reich to eliminate every Jew they got there hands on? Elie was a prisoner for several years; other Jews survived even longer. Most of these ‘’survivors’’ were ordinary people who did not have any unique expertise that the Germans could have exploited for their war effort. There was no logical reason for them to be kept alive. The very existence of more than a million survivors even today, some sixty years later, contradicts one of the basic components of the holocaust i.e. that the Germans had a policy to eliminate every Jew they got their hands on. 2) Why is their no mention of the Holocaust in Churchill’s six volume History of the Second World War or the wartime memoirs of either De Gaulle or Eisenhower or any of the other lesser luminaries who wrote about the Second World War. Keep in mind all these were written years after the war ended and thus after the holocaust had been allegedly proven by the Nuremberg Trials? With regard to the Holocaust, the silence of these “ cognoscenti “ is deafening! 3) What was an inmate infirmary (and a brothel) doing in Auschwitz if in fact it was a death camp? 4) Why would the Germans round up Jews from their far flung empire, thereby tying up large numbers of personnel and rolling stock, while fighting a world war on two fronts to deliver people to ‘’death camps’’ hundreds of miles away who were then executed upon arrival…wouldn't a bullet on the spot have appealed to legendary German sense of efficiency? 5) Why after sixty years have historians been unable to come up with a single German document that points to a holocaust? Should we believe the likes of Raul Hilberg that in the place of written orders there was an “incredible meeting of the minds” by the literally tens of thousands of people who would have had to coordinate their actions in order to carry out an undertaking of this magnitude. 6) How come it is still insisted upon that six million Jews were killed when the official Jewish death toll at Auschwitz, the flagship of the Holocaust gulag, has been reduced from an immediate post war figure of 3 million, to a figure of somewhat less than one million? Why do many respond to this observation by saying, “ what's the difference whether it's six million or one million’’. The answer is that the difference is five million. Another difference is that saying so can get you three years in an Austrian jail...just ask David Irving! 7) All of Germany's wartime codes were compromised including the one used to send daily reports from Auschwitz to Berlin. The transcripts of these messages make no mention of mass executions or even remotely suggest a genocidal program in progress. Furthermore it has been insisted that the Germans used a kind of euphemistic code when discussing their extermination program of the Jews e.g. final solution, special treatment, resettlement, etc. Why was it necessary for them to use such coded euphemisms when talking to one another unless they thought their codes had been cracked by the Allies? 8) The water table at Auschwitz lies a mere 18 inches below the surface which makes claims of huge burning pits for the disposal of tens of thousands of victims untenable. 9) Initially claims were made that mass executions in homicidal gas chambers had taken place in camps located within the boundaries of the old Reich e.g. Dachau, Bergen-Belsen. ‘’Evidence’’ to that effect was every bit as compelling as what was offered for other camps, located in occupied Poland, yet without explanation in the early sixties we were told that this was not the case and that all the ‘’death camps’’ were located in the East i.e. Poland outside (some would say conveniently) of the probing eyes of western scholars. 10) No one has been able to reconcile the eyewitness accounts that personnel entered the gas chambers after twenty minutes without any protective gear and the fact that Zyklon B was a “time release” fumigant that would have had a lethal capability for at least another twenty-four hours. And that even after twenty-four hours the corpses would have themselves remained sufficiently contaminated by the hydrogen cyanide gas that they would have had the capacity to kill anyone who touched them who were not wearing protective gear. 11) Why do we no longer hear claims that the Germans manufactured soap, lamp shades and riding britches from the bodies of dead Jews…could it be that in the light of modern forensics and DNA knowledge these claims are totally untenable? 12) Why do we no longer hear claims that huge numbers of Jews were exterminated in massive steam chambers or electrocuted on special grids…’’evidence’’ of this was presented at Nuremberg…evidence that sent men to the gallows. 14) Elie Wiesel has been described as “the Apostle of Remembrance” yet in his memoir, ‘’Night’’ which deals his stay at Auschwitz he makes no mention of the now infamous homicidal gas chambers. Isn't this a bit like one of the Gospels making no mention of the Cross? 15) Virtually every survivor who was examined at Auschwitz says that he or she was examined by the infamous Dr. Mengele. 16) According to survivor testimony, hundreds of thousands of Jews were executed at Treblinka and then buried in mass graves in the surrounding area. Why is it that extensive sonar probing of these burial grounds reveals that this alleged final resting place for Holocaust victims has remained undisturbed since at least the last ice age? 17) ‘’Proof’’ of the holocaust rest primarily on survivor testimony; there little if any hard evidence. The best of this has been described by Jean Claude Pressac as merely ‘’criminal traces’’. Even Judge Grey who presided at the Irving-Lipstadt Trial commented that he was surprised the evidence pointing to the Holocaust was ‘’extremely thin’’. To paraphrase Arthur Butz, ‘’a crime of this magnitude would have left a mountain of evidence’’…where is it? There was more hard evidence against OJ Simpson at his trial and he was FOUND INNOCENT! 18) Why has Holocaust Revisionism been criminalized in at least eleven countries…what other historic truth needs the threat of prison or the destruction of one's career to maintain itself. Should someone be sent to prison for expressing skepticism about the official Chinese claim that they suffered thirty-five million dead in World War II. 19) Why do the court historians insist that “denying the Holocaust” is like denying slavery or saying the earth is flat when it is nothing of the sort. The leading Revisionists are first rate scholars who hold advanced degrees from the world's leading universities. Is there anyone comparable among those who say the world is flat or that slavery never existed? 20) Promoters of the Holocaust have expressed concerns about the remembering the holocaust once the last survivors die. Why haven't Civil War historians expressed similar concerns since the last survivor of that conflict died in 1959. 21) Survivors of the holocaust have testified that smoke billowed from the crematoriums as they consumed the bodies of murdered victims…some eyewitnesses even claimed they could detect national origins by the color of the smoke. How can this be reconciled with the fact that properly operating crematoriums do not produce smoke of any color? 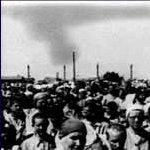 22) According to the official version of the Holocaust hundreds of thousands of Hungarian Jews were rounded up in mid 1944 and sent to Auschwitz where most were gassed immediately upon arrival and their bodies were disposed of by burning in huge open air pits using railroad ties and gasoline. Why is that there is no evidence of these huge funerary pyres in the high resolution surveillance photos taken by Allied aircraft who were over flying the camp on a daily basis during this time period. Furthermore, why have no remains been found, since open pit burning, even when gasoline is used, generates insufficient heat to totally consume a body? 23) All of the liberated camps were littered with corpses; is there a single autopsy report or any other forensic evidence that shows that even a single one of these deaths was a consequence of poison gas? 24) The death toll for the Holocaust relies exclusively on population statistics provided by Jewish sources; has any independent demographic study been produced that shows that approximately six million Jews were “missing” at the end of the war. 25) Why do the wartime inspection reports of camps made by the International Red Cross contain no references to mass executions…it strains credulity that such monumental crimes could be hidden. The only explanations are that either these crimes were not occurring or that the Red Cross was complicit in a cover up. 26) Why has there been no effort to respond to the Leuchter Report? 27) “The Holocaust was technologically possible because it happened “. Why is this intellectually bankrupt argument, which turns scholarship on its head, considered by the promoters of the Holocaust as historical truth, considered a sufficient response to the mounting Revisionist evidence to the contrary? 28) What other historical truths rely to the extent that the holocaust does on so-called “eye witness” testimony…and why have none of these witnesses ever been cross examined? 29) According to the official version of the Holocaust, the Jews remained ignorant of their fate until the very end so skillful were their Nazis murderers in deceiving their victims. How can this ignorance be reconciled with the fact that the Jews have historically been as a group, the most literate and highly informed people on the planet with legendary access to the highest echelons of government. it´s hard to imagine that someone who reads this can still believe. But "it happens, so it must be possible"
That's exactly what I thought. I saw this on another highly used posting website, and I just can't understand how anyone who read it, would not question the holocaust. I think I have an answer though: the medium of text, in this case, can't compete with newer mediums like movies, videos, images. Grabbing someone emotionally will persuade, more than grabbing someone logically. Something like that. This little paper is a very handy introduction to revisionism for those who are not familiar with the idea or who have reservations. I've sent it around to a number of people. Nice going Giuseppe wherever you are. Hi Guiseppe - Nice summary on the holocaust. After having debated this topic on this website and with some of my friends during the last few years I would like to add the arguments that I have gradually learned to have worked best for me. Warning: I think that if anyone gets into a discussion about the holocaust one should make it perfectly clear that one acknowledges that: (1) the Jews were persecuted in Nazi Germany and Europe. (2) That as many as a million Jews in total, maybe more, probably less, died in the camps, on the Eastern front as reprisals, shot as saboteurs, partisans, and soldiers and so on. If you do not make these two points absolutely clear, perfectly clear and totally clear people will think are you crazy, a Nazi, or both. The Zionists have done a fantastic job creating this myth, especially in some countries, and to rush into your reasons why you know it is a myth without heeding my warning will just bring you grief. If you immediately start listing your favourite hundred reasons why you no longer believe the myths without taking heed of this warning you might be (1) shot, (2) arrested (3) punched out and/or (4) dismissed a fool or lunatic. In any case here are some of my most successful arguments. (1) Despite dozens of eyewitness reports, the confessions of Nazi camp directors, the claims of the British and American soldiers and worldwide newspaper reports, the reports of gassing of Jews in Germany were relatively quickly proven to be just silly stories, camp rumours, an attempt to whitewash the real horrors of the war, to cover up the real reasons of a totally unnecessary war, and to bring billions to Israel. What makes us believe for a single second that the same claims of gassing in the so-called Polish death camps are not just as silly? It makes no sense to think the stories of Poland would be true when the same stories of Germany were proven to be silly. Don’t get too hung up or sidetracked on the “reasons” for the holocaust. Keep it simple: No German gas, no Polish gas. (2) The pictures of the dead and dying, as horrible as they are, taken in Germany and not Poland by the way, are obviously not pictures of gas victims. These pictures of the dead and dying, many of whom were dug up from their graves by the British, show all the signs of disease, and are obviously not pictures of recently healthy people just gassed. Just as 2/3 of all the 650, 000 soldiers who died in the American civil war and probably every war ever fought, before or after, until the discovery of penicillin and anti-biotics, were victims of disease, the great majority of camp victims died of disease. The rest were shot for one reason or another, were murdered by their fellow prisoners or committed suicide. Most people do not realize how even the great Napoleon lost most of his army in Russia due to disease, not guns. During the British Boer War the Brits put 125, 000 Boer women and children in camps and within a short time 25, 000 died. Every one knows just how fast the people starting dying in New Orleans just after hurricane Katrina. Finally two of the worst holocausts in the history of mankind were the flu after WW1, which killed almost 20, 000, 000, spread by soldiers returning home with a new type of flu from foreign lands, and of course the near total destruction of the North and South American Native populations which killed at least 50 million and probably a lot more due to every disease from syphilis, and gonorrhoea to measles, typhus, small pox and dysentery. People die very quickly when they live in unsanitary conditions. How many people do you know who have died or are dying of cancer, for example, which as you know, is caused by pollution, DU and so on. (3) There is no scientific explanation how the gas got into or out of the gas chambers. Zyklon B gas is just a little lighter than air and so to suddenly release so much gas from the chamber that has just killed as may as 2000 people at a time every hour upon hour would surely have created, at times, huge deadly gas clouds that would have killed hundreds, if not thousands of guards, workers, administrators and prisoners from time to time throughout the entire camps. Recall, according to the Cole video, the Auschwitz gas chamber, actually the SS bomb shelter, was a mere 50 m from the guard’s barracks and in full view of the camp. What would a gas cloud have done to the guards and others on many a down cast day in that camp? Getting the gas into the rooms is also a huge problem for the mythmakers now that we have dismissed all their silly stories of showers and holes in the roof. How does one get the gas into and out of the room? Think about it. No gas, no gas holocaust. (4) A single human body, with all due respect to the late and never found Jimmy Hoffa, is all but impossible to get rid of without leaving a trace behind; getting rid of six million bodies would be six million times impossible. Cremation does not turn a body into dust. Even after at least two hours of cremation in a modern crematorium the bones of a single body must then be pulverized to turn the larger bones into “dust” so as not to leave any of the remains of the departed one in a recognizable form. Even then in a modern cremation system, even after pulverizing the bones, many large fragments remain. It is for this reason that the dust then must be filtered before putting it into the family urn. Of course 60 years ago these small bones parts and dust would have remained a huge problem. They wouldn’t just float away in a river since bones sink, and they won’t just blow away with the wind. Where did the bones go? On the average a human body creates 5 pounds of bone fragments. 5 pounds of bones per body times up to 25,000 victims a day, as claimed in some of the camps, means the disposal of 125, 000 pounds of bones a day. Can you imagine 62.5 tons of traceable, DNA recognizable human remains, every day during the holocaust drifting around the camp? Where did it go? Not one camp has shown any evidence of mass graves or bones. No bones, no gas holocaust. (5) The cremation process itself has other with major scientific problems. Human bodies do not burn because the water content in a human body is from 60% to 90%. It would take about 500 about pounds of wood or 50 pounds of coal to cremate a body under the best of 1943 conditions. Moreover if they tried to cremate the bodies in open pits, as has been suggested by the myth makers- barbecue style- try it with a pound of meat this summer- the amount of wood required to cremate 25, 000 bodies a day would have taken the entire black forest. Have you ever read about huge trainloads of coal going to Auschwitz every day? No fuel, no cremation, no holocaust. (7) The lies of Babi Yar. After claiming in the book Babi Yar that as many as 100, 000 Jews, maybe more, were machined gunned and buried in huge pits at Babi Yar, we have been unable to find the remains of a single body or single bullet at Babi Yar. No bullets, no bodies, no Babi Yar, no holocaust, what liars. (7) Treblinka. After claiming the prisoners were gassed using huge truck or tank engines, it turns out that these engines are diesel. Diesel engines produce carbon dioxide, not carbon monoxide, the killer gas. It would have been impossible to mass kill with diesel engines. And no one would even try it. Moreover no one has been unable to find any mass graves near Treblinka, or anywhere else, that contain the bodies of 900, 000 dead, as claimed. No Treblinka, no holocaust. (8) Finally it is well documented that the Nazis and the Zionists worked together to remove the Jews from Europe to Palestine. The Zionist went to great lengths to prevent the Jews from escaping to anywhere but Palestine. America, Canada, South America, Australia as a matter of fact all were “persuaded” by the Zionists to bring forth laws preventing Jewish entry. In any case, does this Nazi/Zionist cooperation sound like an extermination plot to you? Nazi/Zionist cooperation, no holocaust. (9) So where the 6 million go? First of all there is no proof what so ever that there were 6 million Jews in Europe in 1939. Nobody knows how many Jews there are in the USA right now: 6 million? 10 million? 12 million? 15 million? It has been claimed for example that there were 3 million Jews in Poland before the war. Who knows? Without re-reading Butz or Sanning again I would say that most of the Jews of Poland started to leave Poland in the 30’s and the majority of them fled East to Russia during the course of the war. Of course a couple of hundred thousand were in the Warsaw Ghetto where most of them had hoped to rest out the war in peace- who could blame them - and many of these Jews did die of disease in the camps. Millions of “Russian” Jews have left Israel, on their way to America, in the last 10 years. Where were they before they went to Russia? The Germans thought that they had as many as 5 million Jews in their conquered countries during the war. 4.3 million Jews claimed compensation after the war. What more do you have to know? How many were there? 5 million subtract 4.3 million is not 6 million. A classic thread. Anyone heard more from Giuseppe Furioso? "A classic thread. Anyone heard more from Giuseppe Furioso?" I think "Giuseppe Furioso"(Furious Joe) is a pseudonym. but now you have to subscribe to the WSJ to read it. Is Michael Santomauro "Furious Joe"? I don't know; but they're "both" Italian. Maybe you could PM Michael Santomauro. Barrington James wrote: Hi Guiseppe - Nice summary on the holocaust. After having debated this topic on this website and with some of my friends during the last few years I would like to add the arguments that I have gradually learned to have worked best for me. There was a policy in Germany to get rid of the Jews. And then there were pogroms especially in Soviet occupied areas, when they were liberated by the Axis powers. These were revenge attacks for Jews supporting the Soviet coercive apparatus. And the "persecution" in Germany is also misrepresented one should emphasize the cooperation of Zionists with the National Socialist government of that time. I agree, but the Altreich-gas chambers also had a come back in orthodox historiography. Most likely they realized that when the Dachau, Mauthausen and Sachsenhausen gas chambers would be known lies, people would wonder about Auschwitz and Treblinka, too. The main problem I see however in the begging the question argument on "what happened to the deported" Jews. If one could show that Jews were deported to Ghettos in the East (Belarus, Ukraine), this would be great. Departures from Auschwitz and Treblinka need to be shown. If one could show that Jews were deported to Ghettos in the East (Belarus, Ukraine), this would be great. Departures from Auschwitz and Treblinka need to be shown. Vast numbers of departures have clearly been shown. This quick example from that thread about British decrypts is just one sample, so extrapolate that out to the full time range of Auschwitz / Birkenau and the numbers are huge. Auschwitz: ‘The total falls from 22,455 on 1st Sept. to 17,365 on 30th Sept. and to 16966 on 20th Oct. No figures for deaths have been given this month and therefore it cannot be said what proportion of the daily departures, which amounts to 2395 on 7th Sept, 1429 on 8th Sept, and otherwise vary between 550 and 47, are due to death: it is however known that at least 11 SS men have been taken into hospital on suspicion of typhus during October. As about 2,000 men in the total are always unaccounted for, it is difficult to be certain in what categories the arrivals and departures belong. But on 7th Sept. the numbers of political prisoners, Jews and Poles have fallen by 1, 2020 and 284 respectively, a net loss of 2305; the net loss in the total column in 2379; therefore it is clear that the majority of the departures are Jews. There you go, the shysters have blundered in their laughable strategy again. As they say, 'lying always catches up with the liar'. Then, not to mention the fact that so many WWII era Jews (who were supposedly 'holocausted') live in the regions east of Auschwitz.